Honda has announced pricing and engine specs for the 2017 Civic. Available from £18,235, Honda's new family hatch will initially be offered with two petrol engines, however, a diesel is expected to be available from October 2017. 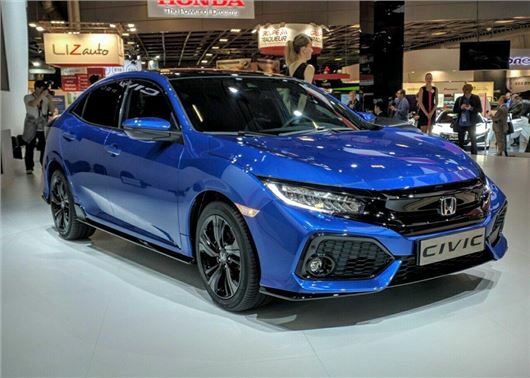 The British-built Honda Civic gets a new, sporty design with a slow slung body, extended wheel arches and integrated rear spoiler. Honda hopes the sharper and more aggressive Civic will increase its appeal to buyers under the age of 40 - a market it currently struggles with. The range starts from £18,235 with the three-cylinder 1.0-litre petrol with 129PS and moves up to £22,470 for the more powerful 1.5-litre four-cylinder engine with 182PS. Both can be specified with a six-speed manual or CVT automatic gearbox. The diesel won't be available until late 2017, but will mostly likely be a modified version of the 1.6 i-DTEC found in the old Civic. The 120PS diesel will be mated to a six-speed manual as standard, although a nine-speed auto will be available as an optional extra. Honda hasn’t released any economy ratings for the petrols or diesel engine, but expect running costs to be low, with the diesel officially exceeding 70mpg. There will be seven trim levels to choose from - S, SE, SR, EX, Sport, Sport Plus and Prestige - and metallic paint will be an option on all, adding £525 to the price. The interior gets a complete overhaul, with thinner front pillars and a wider windscreen. Owing to the wider and longer body, the Civic gets more space between the front seats and increased legroom in the back. The old two level instrument binnacle has been replaced by a colour seven-inch TFT screen, which will allow the driver to customise the display to enlarge the speedometer or show navigation instructions. This primary display is flanked by two smaller colour screens that display coolant-temperature and fuel. Boot space is almost the same as the old Civic, with 478 litres, and the rear seats can be folded and split, which means you can carry bulky items in the back, along with a passenger. The new Civic also gets a handy sliding parcel shelf, which can be packed away under the boot floor when not needed. In addition to the hatchback, an estate version of the tenth-gen Civic should make it to the UK before the end of 2017, while a 300PS+ Type R has been pencilled in for mid-2018. Equipment levels for UK models should be confirmed ahead of the Civic's arrival in the spring.